Recruiting and Retaining Great Talent in the AEC Industry – The 5 Characteristics Your Firm Must Have! Personal branding will help you in both your professional and personal life. You communicate your brand every time you interact with someone else. They can read your energy and form a perception about you in the first few minutes you spend together. Make sure it’s the perception you want people to have of you, because you only have one chance to make a first impression. It takes nine interactions to overcome a bad first impression, and most people aren’t even going to give you one more chance. Determining your strengths and what you enjoy doing can be challenging. This may take awhile to figure out but will set you up for success as you elevate your personal brand. Personal branding is more about you than it is about the other person. Hone in on your strengths. When you focus on improving your strengths, you will get much better at them than if you focus on improving your weaknesses. You need to be aware of your weaknesses, but you don’t need to spend all your time and energy trying to drastically improve them. You won’t. Early in my career, I had the opportunity to take several different tests to determine my strengths. At the time, I didn’t realize the importance, but those test results have helped shape my personal brand, my career, and my business. I learned a lot about myself and how I interact with others, which has helped me both personally and professionally. I am not a detail-oriented person, so when I need something proofread or need to really dig into something, I find others in my circle who have that strength. It comes naturally to them, but it doesn’t to me. There are many different types of tests you can take either for free or by paying a fee. Many employers require new employees to take tests as part of the hiring process. These tests are also often administered when a new leadership team comes into place or when a business strategic plan is about to be initiated. This allows all the team members to understand one another in order to better communicate the vision and mission and successfully implement the plan in the organization. Once you discover your strengths, invest in training to get better at those skills. When you invest in your strengths, you will see measurable results. If you are good at and enjoy learning new software, then maybe you set up systems for your company and write a manual about how to use that software. This could improve efficiency and production within your firm, while playing to your strengths. The company can send you to the software training or conference to learn even more about what the software can do for your company. These are the types of investments that will elevate your personal brand. Invest in yourself whenever and wherever you can. This can also include reading books, audible books, podcasts, webinars, online white papers, or joining leadership master mind groups. There are a plethora of resources to help you grow professionally. Be confident in your strengths and how you add value to clients, company, community, and family. Confidence is something most of us could use more of. I’m not promoting being arrogant, but as a leader you do need to be confident in your talents and abilities. That is why determining your strengths and the value you bring to everyone in your professional and personal life is a step in elevating your personal brand. Once you know your strengths, you can capitalize on them and be confident in the talents you bring to the table. Having a personal mission statement helps you keep your tasks and activities in line with your personal brand. It guides all the decisions you make in life, not just those at work. It’s 1-2 sentences that you can post at work or the screen saver on your phone — anywhere that will serve as a regular reminder. A personal mission statement is the core of who you are. What are you proud of? What is one word that describes you? These are a couple questions to get you thinking about what your personal mission statement could look like. 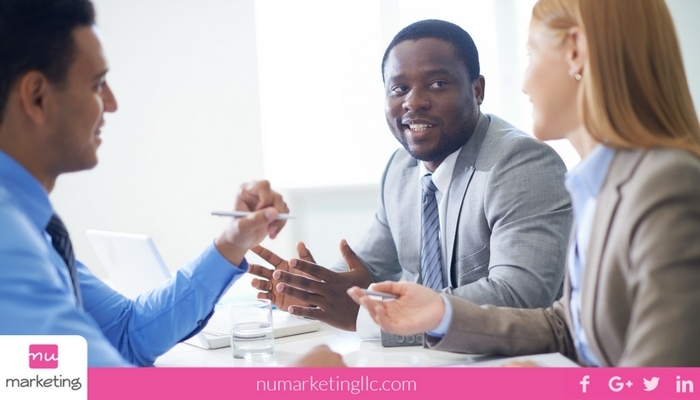 Networking is a big factor in developing your personal brand. Networking basically means connecting your existing connections with others. You should always be thinking about who you know that could help someone else you know. It’s about making that connection happen. When you help other people, they are more likely to return the favor when you need it later on. Many times, it comes back tenfold. If networking is not your gig, don’t worry. Try getting involved in something you are passionate about, whether it be at your kid’s school, church, non-profit, or community organization. It could also be through a hobby like fishing, working out, golfing, scrapbooking, etc. You will meet others with shared interests, which makes it much easier to network and build relationships with them. Personal branding takes years to develop. By using these 5 techniques to build your personal brand, you will be well on your way to happiness and success. 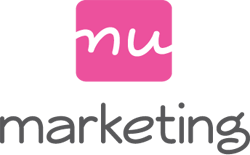 Nu marketing provides marketing and business development consulting for architects, engineering, and contractors. 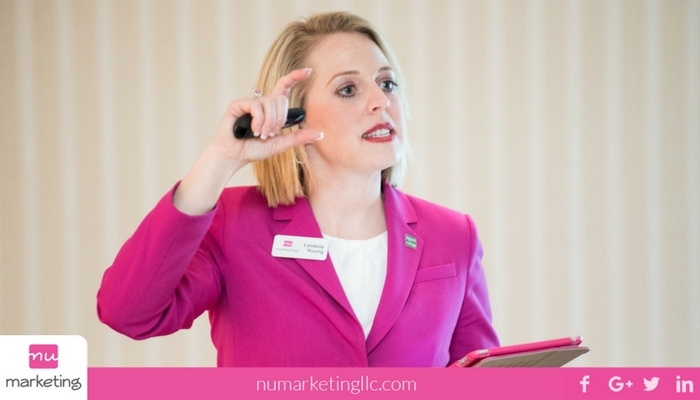 Lindsay Young presents “Branding Yourself For Success – Your Logo is YOU!” for keynotes at conferences and associations. If you are interested in booking her presentation, please contact us today at lindsay@numarketingllc.com or 316-680-3097. Sign up for weekly reminders for the 60 Day LinkedIn Challenge.